New Years Eve is a time to reflect, to set goals, to celebrate good times, and to leave all the bad ones behind. New Years Eve is also a time to be selfish and to take time to really turn inward. Brew some tea, grab a journal or laptop, sit down, and think about your life. Where do you want to see yourself this upcoming year? Once you've established your goals, reflect on this past year. What areas of your life do you want improve on? AndWhat areas of your life do you think you strived in? And after you've figured those things out, you can start to write down lifestyle changes, desires, personal wellness goals, and anything that'll help you get to where you want to be in life. 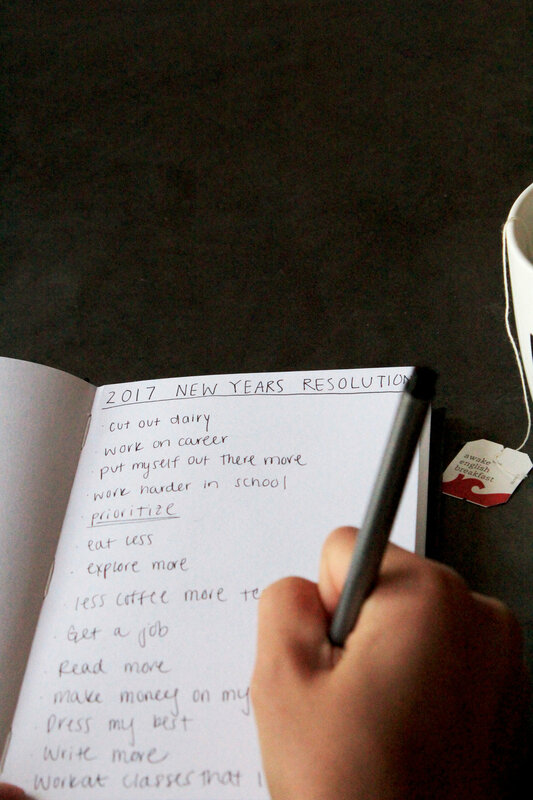 One thing that I found myself doing while writing down my own goals and resolutions was questioning whether or not I could really achieve what I wrote down. If I would actually start doing what I want to do. And I realized that the second guessing came from those goals being out of my comfort zone. I would have to do something that I normally am uncomfortable doing to achieve those things and that made me nervous. But I had to remind myself that bettering yourself is uncomfortable. That "great things never came from comfort zones." -Prioritize my well being and personal goals over nights out partying. -Write more. On my laptop, in my notes, in my journal; anywhere. -Get involved in the community by attending coffee shop events or join local volleyball team. -Stay focused... on what matters to me, my goals, & where I want to be in life. Celebrate the things you've accomplished, people you've met, things you've created, and places you've seen in 2016. And something to remember going into 2017, "A comfort zone is beautiful, but nothing ever grows there." -unknown.